The London Tube Map is a wonderful thing. Making it interactive makes it even more wonderful. The possibilities of what can be done with a fully interactive, SVG (well, RaphaelJS) driven tube map in terms of visualisations are endless. Given that TFL have also made a giant leap towards opening their data, which in itself has sewed the seeds from some pretty exciting projects already; combining the two could be a lot of fun. Is there an easy way to convert this increasingly mammoth tube map into a clean, cross browser, interactive map? The short answer is.... no, but here's how anyway. Allow me to explain why. I'm sure someone will find this post and tell me straight away that I could've done this using a much simpler approach, but this is how I tackled it. Ok, it sounds obvious but this is quite important as it can drastically affect how much work we have to do. I'm not implying that I downloaded the map for New York Metro, but the starting format for this key. 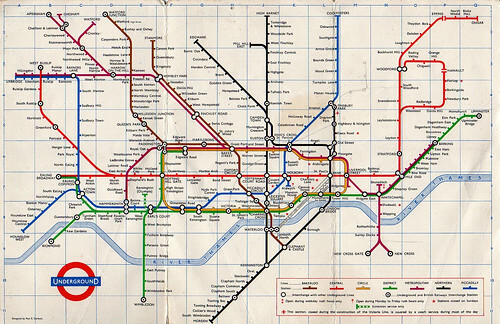 The first part is that we need a vector based tube map, i.e. the PDF or even better an SVG version to start with. I tried both formats, in "normal" and large print. After popping them all into Adobe Illustrator, I clicked around to find the version which had the most amount of clean separation between layers. Turned out the PDF Large Print tube map was a reasonable starting point. I use that adjective loosely. This is probably the most laborious part, but equally the most important to make this thing actually any use. Unfortunately with compressed PDFs, text fields are nearly always seperation in order to preserve the display of the typography as accurately as possible, making lines split into words, and words split into meaningless 1 or 2 letter "phrases". This is great for the human eye, but for actually 'querying' the document, it's useless as we need clean labels for each tube station. Do you see? To start with, we had 5 different (and meaningless) labels, "Ox", "for", "d C", "irc" and "us." Do you also see how I used the Tube line colours for my demo? Now we have the station names cleaned up and ready for conversion (I'll explain how in a minute), it'd make it even more interactive if we could distinguish between the Tube lines themselves as well. Filtering just on the Central and Picadilly Lines, for example. This part is a bit simpler and is actually a really simple technique of getting complex paths into Raphael JS. ...and so on for each line. This is the final stage really. Unfortunately there's no such easy technique for getting text labels into Raphael type code. After a bit of playing around, I wrote a PHP script to help me with this. All you need to do as save the stations, and the stations only into a document. This does mean a lot of copying and pasting, or a lot of deleting of tube lines and artifcats, whichever your preference. However, with this done you should just have a document with a bunch of text labels which you save as an SVG 1.1 file somewhere. Running this PHP script on it will loop through every SVG text node, extract the text and the x and y coordinates for you; making it super easy to plot all the hundreds of stations exactly where they were in SVG, using Raphael. One last thing to note is that it seems line breaks (which are essential to mirror the layout of the Tube Map) are converted into seperate text fields when saving down to SVG. For this reason, and its not the cleanest solution I admit, I tokenised the strings with "%%" to represent a line break, which were then converted into line breaks using the code above. As a farewell I will leave you with the 2 SVG files which took the most time to produce and will do most of the work for you. I'm sure they could be cleaned up even further, and I'm open to any suggestions on how to do so. All should be labelled clearly for ease of use. Good luck!